I was curious though about how it got its name ‘红油抄手’, because for all I know, it is the usual wanton dumplings drowned in a chilli oil and black vinegar sauce. After reading up a bit online, I learnt that the term ‘抄手’ is actually a dialect of the original Sichuan term for wanton ‘餛飩’, which is what we know as ‘云吞’ locally. In actual terms, ‘抄手’ refers to the way one folds the arms when one is cold. 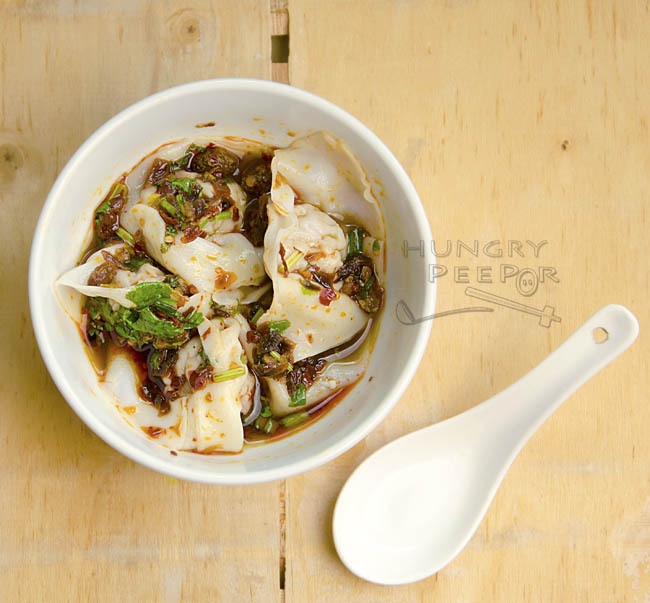 This term is used in a figurative manner for the dumpling because of the way the two edges of the dumpling meet in the middle when it’s wrapped and folded up into an ingot, which looks similar to the way the arms are folded when they cross each other, hence the adaptation of the term for this dish. 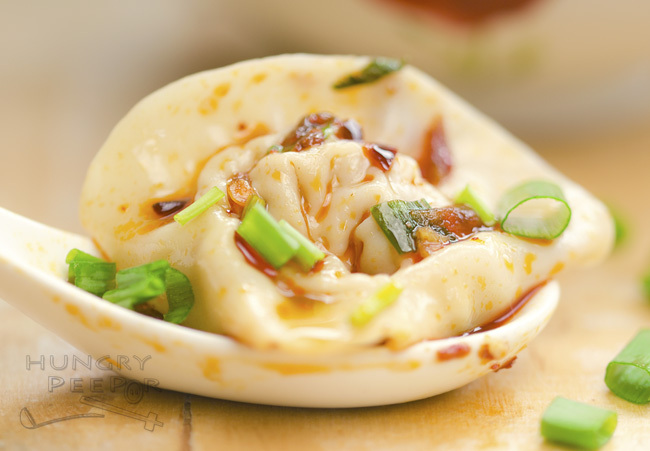 ‘红油’, of course, refers to the red chilli oil that is used to dress the dumplings. After trying this dish at the restaurant, I told myself there’s no other way I want my dumplings served to me in the future. It has to be in a red sauce, with loads of chilli oil and black vinegar – the more the merrier. That’s a bit extreme I know, but that’s life’s little pleasure for me. Can’t wait to make another batch already! Combine minced pork, ginger, oyster sauce, half of spring onion, half of coriander, egg, salt, sesame oil, fish sauce and white pepper. Marinate overnight in fridge. 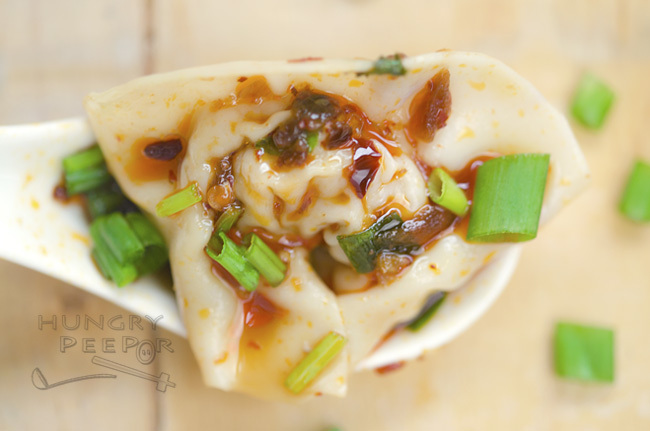 Place about 1 heaped teaspoon of pork mixture in a wanton skin wrapper, folding half horizontally first, and then the bringing the folded edges together to form an ingot (refer to CiCi Li’s video on how to make Sichuan Chilli Oil Wanton to see how to fold the ingot). Repeat for the remaining wanton skin wrappers till all the minced pork mixture is used up. Boil water with with 1 tsp oil. Add wantons into water and cook for 3 – 4 min until the skins become transparent. Spoon out into serving bowls. In the meantime, combine chilli oil, black vinegar, sesame oil, Shaoxing wine, sugar, salt, fish sauce, garlic and the remaining spring onion and coriander. Mix well. 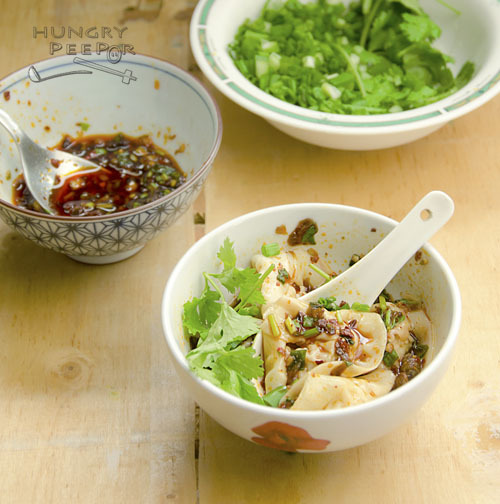 For each serving of wanton, spoon 1/2 cup soup from cooking the wantons into the serving bowl. Spoon in 2 tbsp chilli oil mixture to mix. Garnish with remaining coriander to serve. Spoon the wantons out quickly after the skins turn transparent. Overcooking would lead to the skins becoming too soft and limpy and breaking easily into the pot of cooking water. This entry was posted in Chinese, Pork and tagged Chilli, Dressing, Dumpling, Sichuan, Wanton. Bookmark the permalink.